Road Trip: Brodard’s Chao Tom! | Delicious! Delicious! Road Trip: Brodard’s Chao Tom! A bright red, completely restored 1975 Volkswagen Super Beetle motors down the road with four occupants smushed inside. MATT, smartly dressed with unassuming good looks, sits with Caryn in the back. Vic drives with Winnie by his side. How much farther? I’m starrrrrrving. Caryn groans and shifts in her seat, accidentally kicking Matt’s shin. Maybe we should’ve taken my car. This baby will take your little Audi any day! Matt, Winnie, Vic and Caryn are now crammed around a small table loaded with Vietnamese fare. Did we order too much? Maybe we should order more. The table is quiet for a moment as the four friends are busy wrapping cha gio, the Vietnamese version of spring rolls, in the traditional greenery, dipping in fish sauce and stuffing into their mouths. So, he’s out of town? Does that mean you don’t have to go to work? No, I still gotta go. I’m restocking the kitchen and planning menus. Anyone want the last one? Everyone shakes their heads as Vic grabs the spring roll. The others pile their plates with banh cuon, smooth rice batter crepes stuffed with meat and vegetables. My favorite! Can you imagine his face if I served banh cuon to him? Winnie swallows a laugh with the bite in her mouth. When does he get back? Don’t know. I didn’t even know he was leaving. Winnie enviously watches Vic grab the last of the chao tom, ground, spiced shrimp that is grilled on sugar cane and then wrapped with greens in rice paper. He dips it in the warm, spicy-sweet peanut sauce. 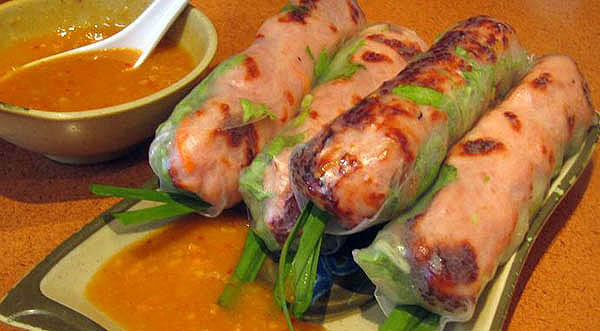 Aren’t you going to have any banh cuon? It doesn’t look as good as when you and Caryn make it. Caryn grins. Matt pushes his plate away and leans back to let his food digest, stretching his long legs under the table. Good choice. I like this place. Inside Fortune Mall, use the rear entrance. Worth the wait for a table.